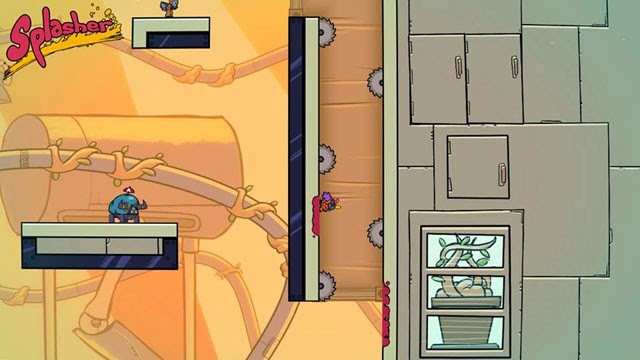 Splasher, from the similarly-named Splashteam (game site), is an action-platformer that is all about splashing liquid. The player takes on the role of a Splasher who has escaped from the evil Inkorp, and now he's going back in, fully equipped with his Splasher gear, in order to free his companions. In addition to liquid-based projectiles, the player can also use liquids to splash onto walls and climb them, and he can release a spray that lets him jetpack high into the air. Players must blast enemies, dodge lasers and saw blades, escape rising pools of slime, and free his fellow Splashers imprisoned around the complex. Splasher is now available for PC, Mac, and Linux via Steam, Humble Store, Itch.io, and Green Man Gaming, and is planned for PS4 and Xbox One this spring.